This is a review of the second book in Laini Taylor's fabulous Daughter of Smoke and Bone trilogy, with thoughts on the first book (HERE BE SPOILERS!) and the construction of the trilogy as a whole, because I think Taylor is doing some really interesting series-crafting. I loved Daughter of Smoke and Bone when I read it last autumn and included it on my list of favourite books read in 2011 (here). I didn't review it at the time, however, because I felt I needed to think about it a bit more. 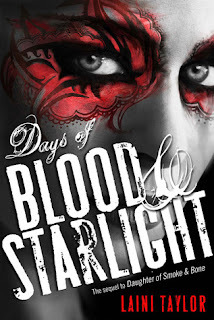 The novel is a fantastic take on what I suppose would be considered the paranormal romance genre - as the main character, Karou, is apparently human, and enters into a passionate romance with an angel. Except that the novel also explodes that genre, leavening everything with a good deal of quirky humour and, ultimately, a tragedy of apocalyptic proportions, stretching across two lifetimes and two worlds. In the first installment, Karou discovers that she is, in fact, not human but a chimaera and that her life as a blue-haired art student in Prague, running errands for Brimstone - a collector of teeth, seller of wishes - is really a second chance. This is what Karou discovers when she and Akiva, the angel mentioned above, break the wishbone Brimstone always wore and Karou was never allowed to touch. And this is where my one quibble came in. Taylor makes a very bold move when that wishbone is broken. 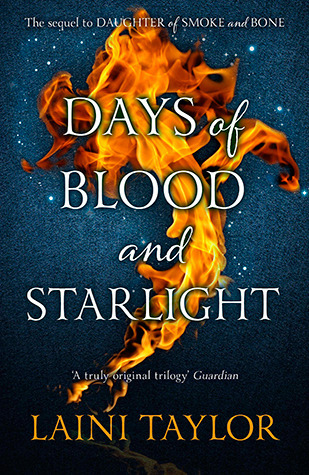 A large chunk of the novel's third act is an extended flashback, in which Karou re-experiences her former life as a chimaera in the world of Eretz, when she fell in love with Akiva for the first time, even though the seraphim and chimerae are sworn enemies and have been at war for centuries. It follows Madrigal (Karou's previous identity) through her capture and execution by the Warlord's son and then her salvation by Brimstone, who trades in teeth because he uses them to resurrect the dead. When I first read the novel, I raced through this section as quickly as possible, trying to put together the clues to Karou's old life and figure out her relationship with Akiva. It's very risky to introduce a flashback of this magnitude with new characters and, in this case, a brand new world. It can backfire, as most would argue backstory section in Arthur Conan Doyle's first Sherlock Holmes novel, A Study in Scarlet, does. In that case, it bogs down the properly interesting detective story with much less interesting narrative of Mormons in Utah. Here, I think it works. I especially think it works because it allows the second novel in the series to get off to a proper start, since Taylor has already laid the groundwork for the characters and conflicts Karou must deal with in Eretz. But I felt and still feel that in both the backstory in Book One and the narrative proper in Book Two, Eretz is not drawn in as detailed a fashion as I might like it to be. I'm not the kind of fantasy reader who demands incredibly intricate world-building, but I do feel like I would like more. Eretz doesn't feel as real to me as Karou's life in Prague did or as the kasbah in Days does. 31/10/2013 Note: I recently reread Daughter of Smoke and Bone and enjoyed it possibly even more the second time. The writing is beautiful, the characters are magnificent, the fated nature of Karou and Akiva's love is hinted at in ways that I totally missed the first time. Also, I think I may have done a disservice in my little criticism of the world-building of Eretz - there is a fair bit of detail there, which I think I missed on my first read because the plot compelled me to read so quickly. Now that my quibble is out of the way, I want to lavish some praise on Taylor's structuring of the trilogy. Once Karou's previous life has been revealed, Akiva then makes the astonishing revelation that, in revenge for the chimaerae's killing of Madrigal, he has just been responsible for their genocide and Brimstone, the only father Karou ever knew, is dead. Karou leaves Akiva and passes through a portal in the sky to Eretz, creating as jaw-dropping a cliffhanger as Lord Asriel walking into the sky at the end of The Golden Compass. The ending of Book One blows everything wide open. The mystery of the disappearing portals to Elsewhere that was such a big part of Daughter is nothing in relation to the much higher stakes of Book Two. Where Daughter was in large part a romance, Days sees Karou/Madrigal and Akiva perhaps forever sundered because of Akiva's destruction of Karou's people. As she puts it, it's as if Juliet had woken to find Romeo still alive - but learns that he has destroyed her family and city. How can they possibly be together after a breakage like that? 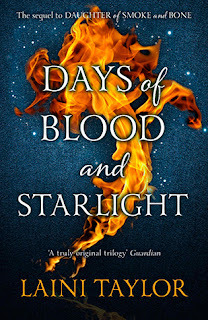 Days follows Karou and Akiva as they separately deal with the politics within their own peoples and try desperately to find a way to end the neverending war between the angels and chimaerae, a war in which both sides are culpable and both sides have suffered greatly. Characters on both sides are revealed in all shades of grey; politics and stratagem are delineated with the subtlety of Megan Whalen Turner's Thief books; the prose is propulsive, while also being striking and often hilariously funny. An important sub-plot is the romance between Karou's Prague friends Zuzana (who resembles a "rabid fairy") and Mik, which gives the otherwise quite dark book a necessary shot of humour and humanity. The book has two separate and very big climaxes, one of which is especially brutal and visceral and had me tense with dread. Book Three, due out in 2014, looks set to play out a war in heaven that could have grave impact on the human world. I'm hoping that against all the odds, Karou and Akiva will somehow find their way back to each other.